This month is a massive rush of new hardware. Users fond of high-powered portables are probably losing their minds; while Windows 8 and RT are of questionable value to desktop users, hardware designed to take advantage of them is flooding onto the market. Likewise, the SoCs powering smartphones continue to advance at a breakneck pace that hasn't really been seen since the dawn of the Pentium era. It's easy to forget that for how powerful portable technology has become, the potential for desktops and desktop workstations is downright monstrous. For the foreseeable future, there will always be a need for CAD, video, and 3D rendering workstations. Basic desktop users see grossly diminishing returns on performance after about four logical cores (eight threads), but workstation tasks can still soak up every last ounce of performance you can throw at them. For major businesses where time very truly is money, that means needing the fastest hardware you can find and maintaining uptime for as long as humanly possible. That, in turn, means finding a workstation that's both reliable and easy to service. Lenovo hopes to address these needs with the ThinkStation D30, a dual-socket workstation capable of sporting up to sixteen cores and dual NVIDIA workstation cards (including the Quadro 6000 and Tesla cards for Maximus support). In Lenovo's lineup, the D30 really is as big as it gets. We've seen more modest workstations from Dell and HP and even tested Intel's powerful Xeon E5-2687W, but this is the first dual-socket monster we've gotten our hands on. 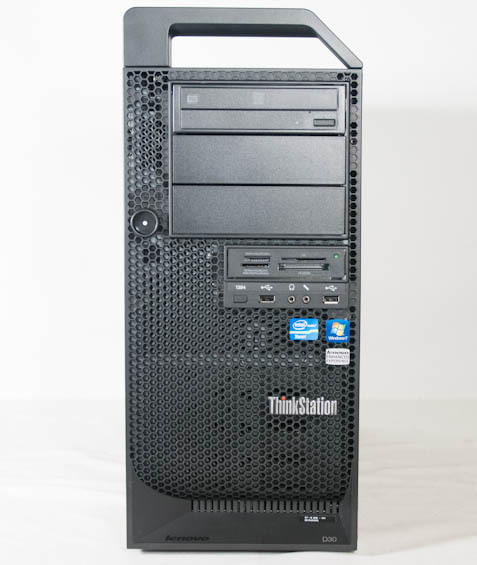 Our review unit is configured with a pair of E5-2687W processors along with a single NVIDIA Quadro 5000 graphics card. I want to be clear: this level of performance is probably available from other vendors (at what cost is another matter entirely), and Lenovo does have to contend with Dell's excellent desktop workstation designs as well as HP's stellar enterprise-class notebooks. Dimensions 8.27" x 23.7" x 19.09"
I've reviewed beefy, expensive hardware before, but never anything that went into the five figures. Enterprise-class systems often have absurd premiums attached to them, though, and those premiums help cover the cost of onsite service as the need arises. The Intel Xeon E5-2687W has an OEM price of nearly two large on its own, a TDP of 150W, and is basically the most powerful workstation chip Intel currently produces. Lenovo shipped our review unit with two, and each has 8GB (4x2GB) of ECC DDR3-1333 attached to it running in quad-channel for a total of 16GB of RAM. On the GPU side is NVIDIA's Quadro 5000. The Quadro 5000 is a cut-down GF100, but remember that big Kepler, the GK110, was just released into the wild as a Tesla card and still has no workstation GPU equivalent. It has a maximum rating of 152 watts, substantially lower than desktop Fermi ever really hit, and has a nearly $1,800 price tag at retail. For this card, Lenovo only charges a modest upgrade premium, while the Xeons are marked up roughly 1/3 more than they list for. Interestingly our review unit came with a single 2.5" SAS mechanical hard drive instead of an SSD, and I'm not entirely sure why they went this route. The drive has a $300 premium on its own; SSDs with similar capacity can be had at a similar price, but Lenovo's SSD storage options are severely limited. On their configuration page, only a 128GB SSD is available, and that's $200 more expensive than the SAS HDD. If Lenovo wants to be more competitive, they need to offer better choices for the storage subsystem than one 128GB SSD. When editing video, storage speed can become very important in a hurry; if your system is bottlenecked by your storage subsystem, your CPU won't be able to stretch its legs, and I can see that issue exacerbated on a 16-core, 32-thread demon like this one. "I grabbed a spare 60GB OCZ Vertex 3 I had laying around"
Exactly. He mentioned the 60GB SSD had little to no impact on anything but the PCMARK Suite which is disk-intensive, so no need to test with a faster/larger SSD. However, in defense of Lenovo (and HP,) Dell has been plagued with capacitor quality problems for nearly a decade from the top-down. I've had so many PERC controllers and workstation/server motherboards fail in one way or another, always traced down to a bad $1.00 capacitor. Have never had this happen with an HP or Lenovo workstation. When the "bad cap scandal" began un 2001, HP had completely purged its supply by 2004, as did Lenovo in 2005. Dell NEVER required its primary suppliers (Foxconn mostly) purge their supplies and refresh with genuine Japanese (or at least quality Taiwanese) caps from Rubycon, Sanyo, Panasonic, and Chemicon. The problem is Chemicon (and Nichicon) have so many counterfeits that it's risky to stock them. Case in point, there are lots of reports of Nichicon caps actually being Nichilon (knockoff name) caps from China. I replaced a SC440 motherboard in a server a few weeks ago manufactured in 2007 that had a number of bulging CapXon caps around the MOSFETs. A PERC 6ir controller with a bad KZG cap preventing array detection, manufactured in 2008. It cost $1 to replace the cap with a genuine Panasonic equal, but it cost the client an entire day without a server and $300 for my services (beats ordering a new $400 card from Dell with another faulty cap. HP isn't completely clear, though. I find numerous low quality OST or underrated caps in their printers and low-end desktops. Seriously, the HP PhotoSmart C6280/C7280 (only difference is a duplexer) and various other model printer based on the same design from 2007-2008 were built using good Panasonic caps that were rated at 10v and installed into a 12v circuit. It's amazing many of these printers run for years before having carriage malfunctions or dropping wifi connections. Again, $4 in caps fixes an otherwise good multi-hundred dollar printer, especially worth it if you've stocked up on ink for them. Many Samsung LCD's from 2006-2007 have known power capacitor problems preventing them from powering on. The 35v 1000uf is used where a 50v 1000uf would have been more appropriate, although the real issue was it being a non-FM cap so it electrical noise caused them to fail prematurely. A huge class-action lawsuit covered HDTV's, but people with LCD monitors were left out to dry. i know anand has said a lot about the life expectancy of SSDs and how 840 with its TLC should last 7 years with light use (which is about 10G write data per day). However, it is absolutely importantly to know your HDD has a lot of activities going on in the background even with your system is idle. look no further than open your windows resource manager and check the disk use. at this very moment, i have 3 pdf open, outlook open, 2 firefox tab open, one IE open, and anti virus. i have absolutely nothing else turned on and my disk is seeing 50 KB/S disk write at the lowest. even at the lowest level, i am expected to write 4G of data everyday when my computer is idle. i do believe anand's SSD life expectancy analysis is somewhat flawed because it failed to include necessary disk writes as part of OS. while 10G write data per day seem to be a large number, it actually isn't. when i start doing video encoding, i can easily break the 10G data cap in at little as few minutes. check it your yourself. Seems to be configured much like an updated 2013 Mac Pro. yes the real competitor to this in the media space is the Mac Pro. We shall see next year when Apple updates the design for their professional workstations, how these machines stack up against them. Joke's on you, FCPX landed with a thud. Premiere CS5 onward even handle old FCP7 projects better than FCPX does. These aren't desktop machines, in case you haven't noticed. Apple does very well in the workstation market there Mac Pro's are aimed at. It's Apple that has been distracted these past two years. Hopefully that will change next year. Apple's enterprise sales for Mac's rose 56% last year, compared to an 8% drop in Windows sales to that space. Don't count them out.